Crews work in the intersection of Pine Street and Van Ness Avenue as construction of the Van Ness Improvement Project continues. In the next two weeks crews are scheduled to work on sewer and water main installation, sidewalk replacement, installing a joint utility trench and street light conduits, and potholing for upcoming work. Northpoint to Bay. Night work is scheduled Monday through Friday, between the hours of 8:00 p.m. and 7:00 a.m.
Bay to Francisco. Night work is scheduled Monday through Friday, between the hours of 8:00 p.m. and 7:00 a.m.
Francisco to Chestnut. Night work is scheduled Monday through Friday, between the hours of 8:00 p.m. and 7:00 a.m.
Lombard to Greenwich. Night work is scheduled Monday through Thursday, between the hours of 8:00 p.m. and 7:00 a.m. Disruptive noise is expected. Greenwich to Filbert. Night work is also scheduled Thursday and Friday, between the hours of 8:00 p.m. and 7:00 a.m.
Filbert to Union. (Monday through Wednesday only) Night work is also scheduled Thursday and Friday, between the hours of 8:00 p.m. and 7:00 a.m.
Union to Green. Night work is also scheduled Monday through Friday, between the hours of 8:00 p.m. and 7:00 a.m.
Green to Vallejo. Night work is scheduled Thursday and Friday, between the hours of 8:00 p.m. and 7:00 a.m.
Vallejo to Broadway. Night work is scheduled Thursday and Friday, between the hours of 8:00 p.m. and 7:00 a.m.
Broadway to Pacific. Night work is scheduled Thursday and Friday, between the hours of 8:00 p.m. and 7:00 a.m.
Clay to Sacramento. *Intensive noise and vibration is expected Thursday and Friday. Night work is also scheduled Monday through Friday, between the hours of 8:00 p.m. and 7:00 a.m. Disruptive noise is expected. Sacramento to California. *Intensive noise and vibration is expected Thursday and Friday. Night work is also scheduled Monday through Friday, between the hours of 8:00 p.m. and 7:00 a.m. Disruptive noise is expected. California to Pine. Night work is scheduled Monday through Friday, between the hours of 8:00 p.m. and 7:00 a.m. Disruptive noise is expected. Pine to Bush. Night work is scheduled Monday through Friday, between the hours of 8:00 p.m. and 7:00 a.m. Disruptive noise is expected. Bush to Sutter. Night work is scheduled Monday through Friday, between the hours of 8:00 p.m. and 7:00 a.m. Disruptive noise is expected. Sutter to Post. Night work is scheduled Wednesday, January 16, between the hours of 8:00 p.m. and 7:00 a.m.
Post to Geary. Night work is scheduled Wednesday, January 16, between the hours of 8:00 p.m. and 7:00 a.m.
Hayes to Fell. Night work is also scheduled Wednesday, January 16, between the hours of 8:00 p.m. and 7:00 a.m.
Fell to Market. Night work is also scheduled Wednesday, January 16, between the hours of 8:00 p.m. and 7:00 a.m. Disruptive noise is expected. Greenwich to Filbert. Night work is also scheduled Monday through Wednesday, between the hours of 8:00 p.m. and 7:00 a.m.
Filbert to Union. Night work is also scheduled Monday through Wednesday, between the hours of 8:00 p.m. and 7:00 a.m.
Green to Vallejo. (Wednesday through Friday only) Night work is also scheduled Monday through Wednesday, between the hours of 8:00 p.m. and 7:00 a.m.
Vallejo to Broadway. Night work is also scheduled Monday through Wednesday, between the hours of 8:00 p.m. and 7:00 a.m.
Broadway to Pacific. Night work is scheduled Monday through Wednesday, between the hours of 8:00 p.m. and 7:00 a.m.
Geary to O’Farrell. Note: Access to Myrtle street from the west side of Van Ness will be limited due to construction. Golden Gate to McAllister. Night work is scheduled Monday through Friday, between the hours of 8:00 p.m. and 7:00 a.m.
McAllister to Grove. 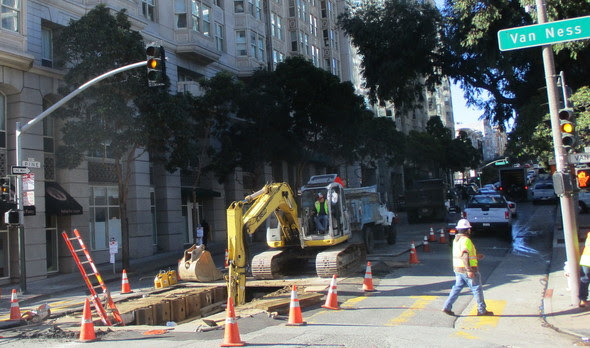 Night work is scheduled Monday through Friday, between the hours of 8:00 p.m. and 7:00 a.m.
Public Works is working to replace aging sewer lines on northern Van Ness Avenue from Bay to Chestnut streets after internal video showed breaks and cracks in the system. This vital upgrade will ensure service is maintained and will not require interruptions during construction. The work that remains to be completed for this program will resume early in 2019. Most construction work for the project has been completed. Crews are wrapping up and performing final striping changes. Find out more and sign up for project updates at sfpublicworks.org/polk. The Lombard Street Vision Zero Project includes constructing pedestrian safety and transit performance enhancements as well as utility improvements on US 101 (Lombard Street at Richardson Avenue) between Francisco Street and Van Ness Avenue. Once work is complete on the project, Caltrans will perform final paving along Lombard Street (U.S. Route 101). Crews are scheduled to install sewer and water mains on the north side of Lombard Street from Scott to Divisadero streets, and from Fillmore to Buchannan streets, through the rest of January. Crews are also scheduled to install street light conduits at the intersections of Richardson Avenue at Francisco and Chestnut streets, and at the intersection of Lombard at Franklin Street, through mid-February. The project is managed by Public Works during construction. For the latest information, including construction schedule and planned activities, please visit sfpublicworks.org/Lombard. 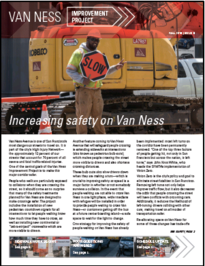 Check out the three-part Van Ness Improvement Project video series to see what’s coming to Van Ness.